The arrival of 2017 brought numerous throwbacks to popular television shows of the past. A number of reboots have already hit the small screen, with more scheduled to appear by the end of the year. Some people are tired of old characters and plots being recycled, but others are thrilled to see their favorite shows pop up again. With a pinch of hope, a dash of anxiety, and just a touch of sentiment, networks are recreating old recipes (and either finding success or meeting disaster). Kicking off 2016 was the return of Full House (as Fuller House) – in which the Tanner girls are all grown up with a newly widowed D.J. taking over her father’s former role. While many fans dove into the new series filled with hope, critics blamed the revival for relying too much on the original series. While that may be so, the show was renewed. And the blasts from the past continued to rage on from there! Gilmore Girls came back with a four-episode revival on Netflix, to mixed reviews. 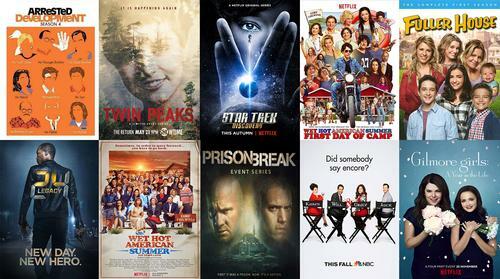 More ghosts of shows past have come back from the dead as well—Prison Break, Twin Peaks (The Return), and Wet Hot American Summer (First Day of Camp and Ten Years Later)—with many more to come. Fans continue to have their eyes peeled for the return of other shows like Arrested Development, Will & Grace, and more. Of course, these are just the revivals that are bringing back old casts together. More reboots with brand-new casts have begun to resurface as well, from 24: Legacy to Star Trek: Discovery. The phenomenon of taking these old c oncepts and bringing them back to life is fascinating. These revivals invite a sense of nostalgia and a return to beloved characters we thought had no more to offer us. (Sometimes, they still don’t—but that won’t stop networks from trying to convince us otherwise!) And, of course, networks are banking on long-time fans wanting to watch these shows—it’s like coming home and seeing old friends. Some of us can’t help but wonder: What is D.J. Tanner like as a mom? What is Rory Gilmore like as a woman in her early 30s? What are Will and Grace up to these days? How much weirder can Twin Peaks get? Yes, maybe some of these shows shouldn’t have been dug out of their graves. But, when you love a show and its characters, it doesn’t matter if you think its reboot is going to be good or bad. You’re going to check in on the characters you grew to love (or hate)—much like when you stalk someone on social media who you haven’t seen in years. Maybe you’ll just watch the first episode, and then move on with your life. Or, maybe you’ll spend a Saturday gulping down every new episode with a side of junk food. Either way, you’ll still be surprised how much older everyone looks. Before jumping into these new reiterations of the same old shows, take some time to get to know (or re-know) the characters that made them successful. Become a fan by checking out some of the original shows from our catalog. Start from the beginning—revisit D.J. Tanner as a preteen, Rory Gilmore’s first kiss, the death of Laura Palmer that shook the town of Twin Peaks, and make up your own mind about whether these shows deserved reviving. The arrival of 2017 brought numerous throwbacks to popular television shows of the past. Love a good reboot -- hoping they bring back Gossip Girl soon. It's been too long. What's Serena van der Woodsen up to as a 27-year-old? I need that Q A'd.